Alexey Miller, Chairman of the Management Committee of Gazprom, and Marc Benayoun, CEO of Edison and Executive Vice President of the EDF Group, have attended a working meeting at the St. Petersburg International Economic Forum 2017. During this meeting, the parties highlighted the progress that has been achieved in setting up a southern route for Russian gas supplies to Europe and discussed issues related to the implementation of the co-operation agreement that was inked by Gazprom, DEPA and Edison on 2 June. This co-operation agreement is aimed at establishing a southern route for Russian gas supplies from Russia to Europe, which would run across Turkey to Greece and further to Italy. Pursuant to the document, the companies will also co-ordinate the implementation of the Turkish Stream project and the Poseidon project in the area from the Turkish-Greek border to Italy. 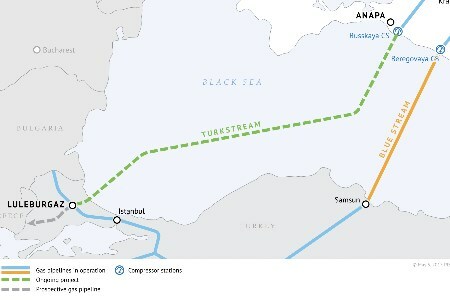 The parties also considered the Turkish Stream and Poseidon gas pipelines. It was noted that the pipelaying within Turkish Stream's offshore section commenced on 7 May 2017, and that the construction of the gas pipeline's second string would make it possible to deliver 15.75 billion m/y of gas to the border of Europe. In that regard, the parties stressed the importance of the Poseidon project for timely creating the relevant receiving infrastructure in Europe. The meeting also reviewed the potential of deeper co-operation in the gas sector.